And good god did those opinions direct me in the wrong direction. I reached a new low. 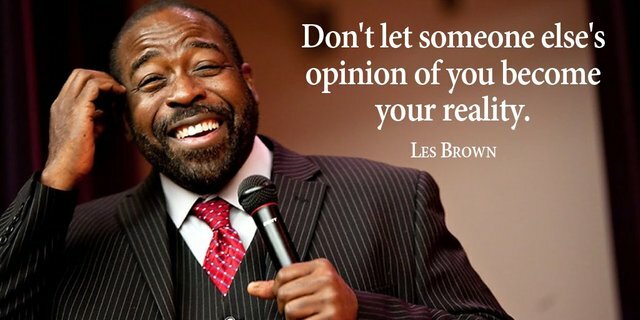 Then I was watching an Elliot Hulse video about emotions and he quoted Les Brown. I searched him up on YouTube and the rest his history. The quote at the top of this post ran through me and clotheslined the negative opinions right outta me! It flushed my mind of the lies that I was told. I opened my mind to a new opinion. I used to allow someone else’s opinion of me to become my reality. Now I control where I want to be. I direct my time away from negativity and I try my best to stand tall. Do not let other people dictate your life. When you are living true to yourself you can fight the hard times and resist the negative temptations because YOU see that light at the end of tunnel. You see your goals and you and only you can decide your destiny.